100 ways to play! What’s your favorite? Will Laura pick Imaginary Play or Board Games? Play-based therapy. Favorite toys and second-hand treasures. Press play. Are you noticing a theme here? Quite simply, we embrace play. There’s nothing quite like it. It’s powerful and fun. 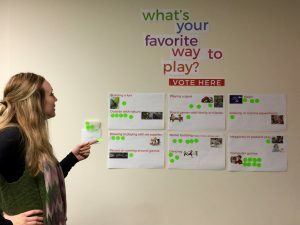 This month, we are asking our clinic families: what’s your favorite way to play? They get to vote in our lobby. While there are no right or wrong answers, you might think so given how long kids take to deliberate. Computer Games or Magic? Sports or Imaginary Play? Dance or Board Games? You try to pick just one. It’s harder than you think! Thankfully, in real life, we can play every which way. Not all day every day. But often enough so that we stop worrying about the crazy winter weather and whatever else might be stressing us out. We laugh. We connect with our loved ones. We learn new things. We live in the moment. We have fun! Need some ideas on how to play? 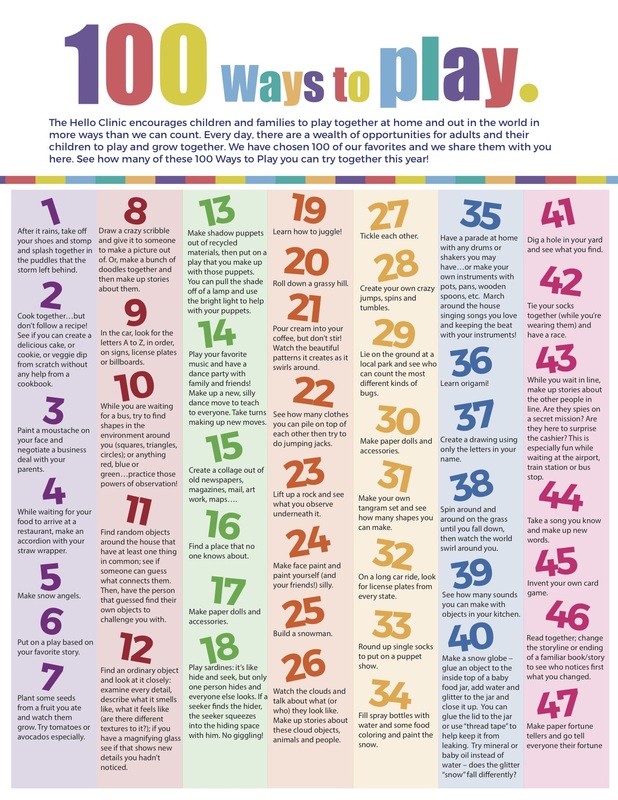 We’ve got a handy list with 100 ways to play. Try a new way to play today, or 100 ways! We double-dog dare you. Click here to download a free PDF of this list!